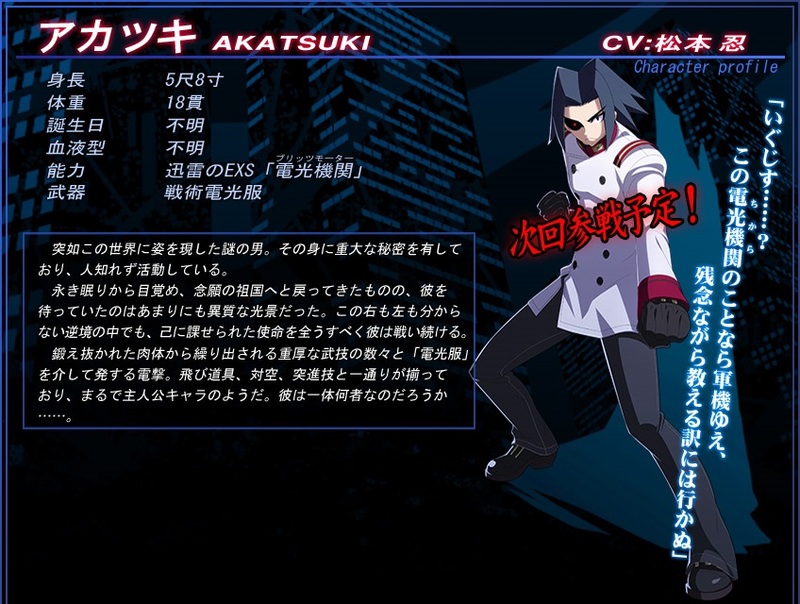 Many japanese fighting gamers got pretty shocked upon the reveal that Akatsuki – the main character from the doujin franchise with the same name – will be added as a playable fighter in the next version of Melty Blood creators game: “UNDER NIGHT IN-BIRTH“. With this inclusion, it leaves many wondering if there is possibilities for other doujin characters to appear as guest as well. I sure would love someone from Vanguard Princess or Touhou, but I guess they don’t fit well in the dark atmosphere from this game. Update (09/05) There are new info and screenshots given to 4gamer during a interview with Narita. According to French Bread’s boss, Akatsuki’s graphics were all done by Akatsuki creators, SUBTLE STYLE. They guarantee that those graphics are all of a very high quality. During the interview Narita also revealed to already have a new collaboration in mind with a even more unexpected game: SkullGirls! However, regarding the graphics, Narita says that, different from this recent collaboration, they would want to make the graphics themselves by all means. The reason for this is because “he wants to teach the westerners what TRUE MOE is!” Do this means that he doesn’t like SkullGirls graphic style? This entry was posted in News and tagged French Bread, Game, News, SUBTLE STYLE. Bookmark the permalink.